I have a soft place in my heart for the BlackBerry Pearl—the first BlackBerry that I actually coveted and used over the past year, magically carrying unbidden email in my pocket. 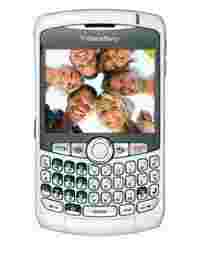 I had discovered CrackBerry religion and now, with the Curve, BlackBerry has found a new way to keep me in the fold. The Curve is the best looking BlackBerry device by far and the rounded design makes it easy to hold, and it’s small enough to use single-handed if you’re just doing a bit of surfing. The full-size, backlit QWERTY keyboard is laid out in a gentle curve, which helps to save space and, despite the small size, with a little practice I was responding to email or composing text messages at a brisk pace, much faster than the Pearl’s not-so-SureType keyboard. The trackball is a great and intuitive device to navigate around the interface and Web pages. At the top, the 2.5 inch, 320x240 pixel display did a superb job rendering everything from Web pages and maps to photos and videos. The standard 3.5mm stereo jack, a USB port and a push-to-talk key are placed on the left side of the Curve, and the volume buttons and camera-launch key are on the right side. The Curve’s mass-storage mode enables easy drag-and-drop file transfers. Size-wise, it’s not that much bigger than the Pearl—it’s a tad wider, slightly thicker and about the same height: 10.7cm x 1.6cm x 6cm. The additional width doesn’t take that much getting used to and the Curve weighs in at a pocket-friendly 111gm, no geeky hip holster required. What truly separates this BlackBerry from the Pearl is its added multimedia capabilities. The Curve’s 2MP camera took some nicely detailed and richly saturated pictures, good enough for postcard-sized prints of a recent home party. The Curve’s inability to record video is a bummer, however. The bundled Roxio Easy Media Creator makes dragging and dropping files to the Curve (and from the Curve to your desktop) easy-peasy. If you want to load videos to go, the software will try to convert all sorts of files to the 320x180, 24-frames-per-second MP4 format that the BlackBerry prefers. Do it during your lunch break as this process takes a while. On a few transfers, I found the audio and video did not sync, so be sure that a video file can play within Desktop Media Manager before you bother transferring it. Music files transferred quite alright. You can drag over MP3 or AAC music files, create playlists, and create, edit and transfer albums of photos. Music playback is smooth and rich, especially heard through audiophile headphones plugged into the grown-up 3.5mm jack. Support for A2DP (Advanced Audio Distribution Profile) is included, so you can stream stereo audio to a compatible Bluetooth headset or speakers. You can add additional storage through a MicroSD card slot. It’s annoyingly positioned underneath the battery, but it’s highly recommended—as you will find the Curve soon filling up with your space-hogging, preferred multimedia content. The Curve is still a BlackBerry through and through: email is efficient and easy to use as always, now with a new spell-check feature. It snappily browses the Web, too, and data transfer tops out at 2.5G EDGE speeds, which is currently on par with Indian cellular networks. An attachment viewer opens popular file formats such as Microsoft Word, Excel, PowerPoint, Corel WordPerfect, PDFs, JPEG and GIF. The Curve also features a speakerphone, voice-activated dialling, smart dialling, conference calling, speed dial and push-to-talk service wherever supported. It’s a world phone, with support for all four GSM frequencies (800, 850, 1800, and 1900MHz). A copy of BlackBerry Maps is included, but there is no data for India up as yet. I preferred to download the quite superb Google Maps directly from www.google.com/gmm. Although there’s no built-in GPS receiver, you can shop around for a Bluetooth-enabled one if you are so inclined. Or, you can opt for the latest Curve avatar—the 8310—with its integrated satellite navigation feature, 3G support and a 3MP camera. I think I’ll stick to the original Curve for a while, as I really don’t need the added features. It’s a perfect example of a smartphone that doesn’t do everything—but everything it does, it does well.